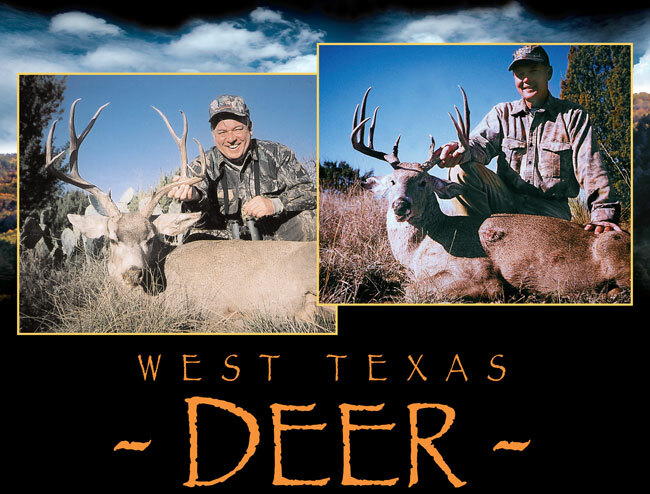 Our west Texas private ranches offer an incredible array of prime Whitetail and Mule deer habitat and lots of deer and shooting opportunities for quality bucks. RBO offers rut hunts that provide our hunters with the thrill of “rattling up” whitetail bucks. Other hunt strategies include “stands” and spot and stalk. Our management strategies involve “under harvest” allowing bucks to reach maturity. All hunts are 5 full days and 6 nights including lodging and meals in ranch houses and 2-on-1 professional guide service. All hunt dates take place in November and December. Combination whitetail and mule deer hunts are available on a very limited basis for hunters wanting to “double up”. Licenses are available over the counter and the opportunity to take predators and hogs is included in the price. Whitetail bucks tend to run in the 130 B&C to 160 B&C class and mule deer bucks run in the 150 B&C class. Past success is above 90% and 100% shooting opportunity. Weather tends to be cool to mild in November and December and can be rainy. For hunters “flying in” Lubbock, Texas is the recommended airport and car rental is available to the ranch location. Plan on 2 hours driving time.